Today's miso soup may not look like miso soup, but it does have miso in it. It shows how to use miso as a background flavoring, instead of the predominant one. Since it has milk and a little butter in it, I've called it Hokkaido style after the northenmost main island in the archipelago that makes up Japan. Hokkaido is quite different from the rest of the country, since it has large stretches of flat, farmable land (unlike the rest of Japan which is very mountainous) that is ideal for farming. The climate is that of Northern Europe or Canada, and much of it is used for dairy production and crops such as wheat and corn. Sapporo is the largest city in Hokkaido, so whenever you see Sapporo on Japanese food (such as Sapporo ramen), it usually means it has some milk, cream or butter in it. 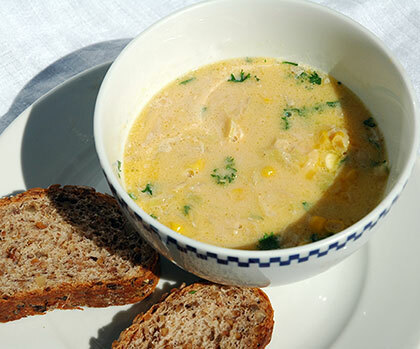 This soup also shows a way of clearing the refrigerator. I had half a cabbage and some spring onions in the fridge, plus a frozen half of a chicken breast, and I always have canned corn around. So it all came together for this soup. It makes a great one-bowl kind of meal, with some rustic bread. You can put in leftover rice or potatoes in the soup too. The miso adds an intriguing sort of meaty flavor to the milky soup. I've given vegetarian alternatives in the recipe. I have used a vegetable stock cube that has salt in it instead of dashi for this, so go a little easy on the miso. Taste and adjust! The Official Testers liked this so much that they ate 5 big bowls of it between the two of them for lunch. Note that this makes 6 cups of liquid + the ingredients, so there is more miso than for the previous recipes. Heat up the water in a pot and dissolve the vegetable stock cube. Slice up the vegetables in the meantime. Sauté the cabbage and onion in a frying pan with the butter or oil until it's just turning limp. Put in the soup stock and simmer until just tender. Add the miso to the soup following the directions for day 1. Taste and add more miso if needed. Garnish with the fresh parsley and the pepper, and serve. Note: if you go for the vegetarian option and use sesame oil and tofu (the preferred replacement for the chicken), it will be much tastier if you briefly sauté the well drained tofu in the sesame oil before adding to the soup. Submitted by maki on 2006-08-31 19:38. I'm looking to duplicate a recipe that I receive at my local sushi bar in Atlanta, GA USA. It is a creamy miso soup that has tofu and shitake mushrooms as the "meat" of the dish. It is so good, that it can be a main meal, and I feel that this recipe comes closest, but I wasn't sure if you had any other ideas. I taste the misto, butter, milk, tofu, seaweed, maybe some of the greens of an onion.... please, your talent is evident, and appreciated. More than likely this is an "Americanized" version, but I thought you might have some thoughts. It could have butter, milk, even cream. It could possibly have sakekasu (the lees left over when sake is made). Since I haven't tasted it I couldn't say more...maybe try asking them for the recipe? I just made this for dinner tonight, it's delicious. :) Thanks Maki! This was very good - my finicky, non-Japanese husband (who only likes things that taste good, he doesn't care if a recipe is "new" and "interesting") enjoyed it, which means that Hokkaido-style aside, it was just plain good. It also gave me some ideas about doing a "corn chowder" type of soup that is full of flavor and not as bacony/creamy as the usual American version - the milk and dashi/miso had so much umami that you didn't miss the heavy fats of corn chowder in this tasty soup.